I didn’t make it to Woodstock, so when Powder Ridge came along just a short distance from my home, I didn’t want to miss it. 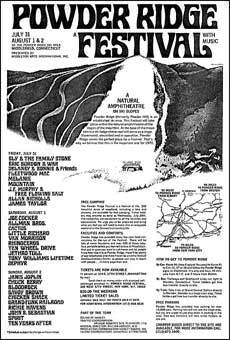 The 1970 Powder Ridge Rock Festival was scheduled to be held July 30 through August 2, at the Powder Ridge Ski Resort in Middlefield, Connecticut. 30,000 people showed up, some of them even remember being there, but there was very little entertainment, no food, and no bathrooms. There were, though, plenty of drug dealers. Local residents were concerned with the impact of the crowd on their small town and obtained an injunction against the festival just days before it began. When the ski resort owner tried to contact the promoters to tell of the injunction, they could not be found, so it looked like the event was never going to happen anyway. It was a disappointment (I was one who never made it all of the way). Police posted warning signs on every highway leading to Middlefield saying: “Festival Prohibited, turn back”. Somewhere around 30,000 people showed up anyway, although most of the performing acts didn’t, with the exception of Melanie and a few local bands. Drugs were openly sold and commonly consumed at the festival. The famed rock doctor William Abruzzi (also at Woodstock) was there to treat bad LSD trips, and said there were more bad trips at Powder Ridge per capita than at any other music festival he’d ever worked. He attributed some of the problems to the barrels of “electric water” that were available for free public consumption; people were invited to drop donations of drugs into these barrels, creating drug cocktails of unknown strength and composition. The concert, or non-concert, received extensive coverage from the New York Times. The promoters originally promised to reschedule at a different location, but it never happened.